Around the IMI Office, summer is known as a time when we have the most staff birthdays, the most creative fun committee events, and the most hectic office environment. During these months, our staff is in a constant flurry of activity, with groups in varying stages of preparing for, facilitating, or debriefing from client events held all over North America. One of IMI’s largest clients, The International Nursing Association for Clinical Simulation and Learning (INACSL) has close to 2,000 members spread across the world. Each year since 2006, it has held an Annual Conference with about 800 attendees. Because much of INACSL’s membership is American, all of its conferences have been held in the United States; that is, until this year. 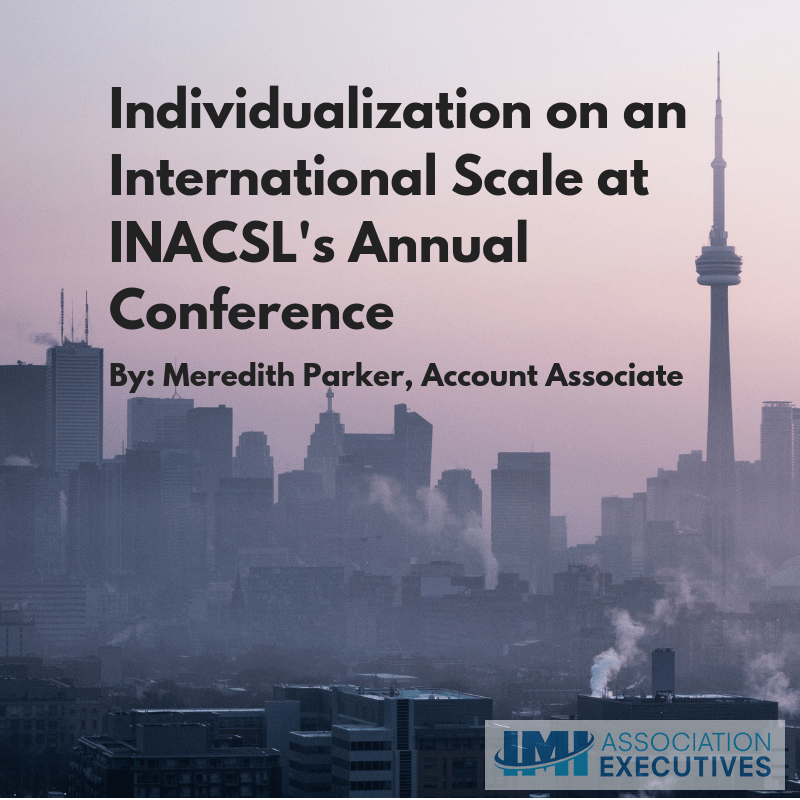 In 2018, in line with its international focus and in order to recognize its significant number of Canadian members, INACSL’s signature event was held in Toronto, Canada. Though Toronto is just a hop over the national border between the United States and Canada, INACSL anticipated that its conference would host many first-time attendees because some of its regular, United States-based attendees would be unable to obtain funding for international travel. Also, INACSL knew from past conference feedback that one of the highest-rated benefits of their conference is networking opportunities. With these factors in mind, INACSL developed ideas to help each of the 500+ conference attendees feel individually touched. First, INACSL created Canada House as a “home away from home” for attendees. During the conference, Canada House hosted light snacks and beverages during breaks, information about restaurants and activities in Toronto, and giveaways like Canadian themed gift baskets and maple syrup – some which were free for all and some which had to be won through games or raffles. Decorated with Adirondack chairs, pictures from around Canada, and the extremely-popular cutout of Canadian Prime Minister Justin Trudeau, Canada House became a popular stop for attendees throughout the conference as a place to grab a quick cup of coffee, gather information about local sights, and a rendezvous point for casual or organized outings, including a run/walk exercise group that met each morning. In addition to providing Canada House as a nexus for conference social activities, the INACSL team created specific opportunities for conference-goers to connect outside of educational sessions. One of these opportunities was pay-your-own-way dinners out. Before the conference, INACSL made six-person reservations at area restaurants for several nights of the event. On-site, they provided sign-up sheets for individuals to claim one of five spots on any reservation, with the sixth spot held by a someone from their Membership Committee. These groups would meet at Canada House, walk to the specified restaurant, and enjoy dinner together. This idea was a hit with conference attendees, especially those who traveled to the conference alone as first time attendees, because it provided a low-pressure way to meet other people in the same situation, get out of the hotel, and experience Toronto culture. In addition, because there was an experienced INACSL member at each dinner, there was a helpful resource for any conference or INACSL-related questions. The INACSL Annual Conference, 2018 was a huge success – and the INACSL Team’s eye for individualization played a key role in making attendees feel welcomed, engaged, and ready to learn. What strategies have you used to engage attendees at a large conference? Comment below. Next PostNext Happy Blogiversary, IMI!